First, the Summit creates a new model for regional cooperation. Established in June 2001 in Shanghai, the SCO aims to deepen good neighbourliness, mutual trust and friendship, to safeguard regional security and stability, and to promote coordinated development. Over the past 17 years, the SCO has forged a constructive partnership that is not an alliance, not confrontational and not targeting any third party. Members have enhanced cooperation on defence, law enforcement and information security, improved the capabilities of joint actions and prevented hundreds of terrorist attacks. They are matching their development strategies to promote cooperation on the Belt and Road Initiative and facilitate trade. They are enhancing cultural and people-to-people exchanges, creating popular programmes such as the youth exchange camp. SCO has also expanded its cooperation with the UN and other international and regional organisations, and contributed to addressing hot-spot issues and improving global governance. With eight members, four observers and six dialogue partners accounting for 20 per cent of the global economy and 40 per cent of the world’s population, SCO is the world’s biggest comprehensive regional organisation in both the area and population its covers. It is an important force for promoting global peace and development, and upholding international justice and fairness. Second, the Summit enriches the Shanghai Spirit. Despite various traditional and non-traditional threats and rampant unilateralism, protectionism and anti-globalisation, the SCO has stood the test of a changing international situation and remains strong thanks to the Shanghai Spirit that champions mutual trust, mutual benefit, equality, consultation, respect for diversity of civilizations and pursuit of common development. It is in this spirit that the SCO members have blazed a path to win-win cooperation. This Shanghai Spirit has much in common with traditional ideals of the Chinese nation that value win-win, inclusion and harmony. These are embedded in ancient teachings such as “the interests to be considered should be the interests of all”, “there should be harmony without conformity” and “all under the sun belong to one big family”. Advocating these ideals in state-to-state relations constitutes the core value of the SCO. The Shanghai Spirit is rooted in the proposition of unity and harmony. It transcends out-dated concepts such as clashes between civilizations, cold-war mentality and zero-sum games, and provides a new perspective and new solution for addressing common challenges in the world. 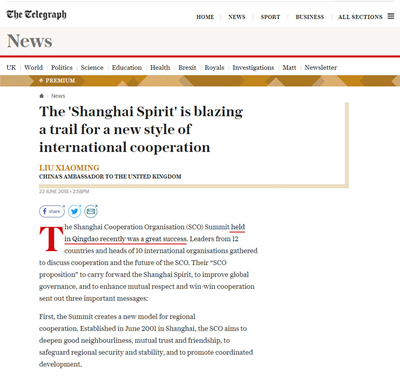 The Shanghai Spirit will continue to provide a strong guarantee for the development of the SCO and make a far-reaching impact on building a community with a shared future for mankind and a new type of international relations. Third, the Summit marks the beginning of a new journey for the SCO. Established by China, Kazakhstan, Kyrgyzstan, Russia, Tajikistan and Uzbekistan, the SCO admitted India and Pakistan last year. The Qingdao Summit, as the first gathering of the SCO family after last year’s expansion, is of great significance for the SCO to build on past achievements and continue to forge ahead. At the Summit, leaders drew up a blueprint for the future of the Organisation, reached important agreements and issued the Qingdao Declaration. A total of 23 cooperation documents were signed, setting a record in the history of SCO Summits. A highlight among these is the Joint Statement on Promoting Trade Facilitation, in which members voice strong support for multilateralism and firm opposition against protectionism by calling for upholding the multi-lateral trade regime with WTO rules at the core and building an open world economy. Vision spurs action and is achieved through action. The SCO is capable of a grand vision as well as concrete actions. In a world that is undergoing profound development and transformation, the SCO has become an important force for stability. Going forward, members of the SCO will work together under the guidance of the Shanghai Spirit to build an open, inclusive, clean and beautiful world that enjoys lasting peace, universal security and common prosperity.